* FIRE: Increase the ATK of this card by 500 points. * WIND: If this card destroyed your opponent's monster as a result of battle, it can attack once again in a row. double-attack effect negation combination yet. That little explanation said, Element Dragon is overall pretty solid. more such cards (besides Element Soldier) to be released. using him in Traditional EVER unless you're playing casual. Element Dragon isn't a bad monster. There's nothing incredible about it, but it's definitely playable in the right deck. With 1500 ATK, it can hold its own; being a Dragon gives him a bit of support and being LIGHT makes him food for BLS-EotB, though playing Element Dragon in a deck focused on getting BLS-EotB out would be a relatively stupid thing to do. If there's a FIRE monster on the field, Element Dragon becomes a 2000 ATK monster. That's definitely not bad for a Level 4. If there's a WIND monster on the field, he can attack again if he kills a monster first (just like BLS-EotB). It would probably be better just to play Element Dragon in a WIND OR FIRE deck than to try to combine both of them. Choose one of his effects and build a deck that utilizes it; if you try to mix and match, the overall theme of the deck is likely going to be weaker. He's nothing spectacular, but he can add a lot of support to a WIND or FIRE deck. I would avoid him elsewhere, however. its name? Element Dragon of course. Stats: Element Dragon has 1500 ATK and 1200 DEF, allowing you to search for it with Sangan, Witch of the Black Forest, Shining Angel, and Masked Dragon. The ATK is very slightly below average for monsters these days, but Element Dragon can get an ATK boost through its effect. It is a LIGHT monster, which doesn’t really help Element Dragon because I can’t imagine it being in a deck that focuses on LIGHT monsters. It’s also a Dragon, giving it a good deal of support. Stats – Average. Effect: Element Dragon’s effect is different than that of most monsters. Dragon can attack a second time if it has destroyed a monster first. WIND monsters; Element Dragon can’t attack up to three times, only two. With all that said, it is apparent that Element Dragon can be a useful monster. which tend to use the two Attributes that power up Element Dragon in bulk. limited, so I may be wrong about this. lots of FIRE or WIND monsters. there are Dragon Decks, giving it some playability. Dragon is shunned in Traditional because it isn’t Chaos Emperor Dragon. Fortunately there are Dragon Decks, giving it some playability. Art: 2/5. It’s a little too muscular for a dragon in my opinion. Konami has recently been trying to jump-start multiple type decks -- this will REALLY be seen in the next expansion with some of the cards we see there. Basically, in order for the card to be any good it has to have another monster alongside it with a compatible type. If a fire-type is out (assuming Blazing Inpachi, UFO Turtle, or Solar Flare), he's a 2000 attacker. If a Wind type is out, he's a stronger Hayabusa Knight. The card has potential for a "mixed" deck that Konami will be begging us to make with a couple of cards in Rise of Destiny, but for now, I can't warrant a high score for it. Theme decks with streamlined types seemed to do better than anything else, and playing another type of card just to get a boost out of this isn't exactly the smartest way to go about utilizing cards. dawnyoshi Element Dragon is potentially one of the best level 4 dragons that could be used in today's game. This card is just begging to be placed into a Horus/Armed combo deck, though combining the two highest levels may prove to be annoying. With a fire attribute monster out, this little dragon becomes 2000 ATK and can go head to head with Berserk Gorillas. Its second effect, if you have a wind monster out, makes it an annoying 2000 ATK dragon that can attack more than once...yeesh. Unfortunately, I can't imagine how playable these decks are, and haven't seen a combo deck using horus and armed dragon do well so far. Unfortunately, this monster is just a bit lacking right now I believe, but this card would be insane in limited. It's definitely worth a third or fourth pick. Again, this is another bit of inspired card design focusing on themes and cohesiveness; gone are the days of single-handed powerhouses like Yata-Garasu. In today’s championship format, Konami hopes to force duelists to create decks that have strong synergy and harmony. Element Dragon falls a bit short of playability, however, due to weak stats and such. Great card design does not alone a good card make; this is a perfect example of a card that falls just a bit short. Advantage F/H: All dragon decks should be running Luster Dragon’s. In today’s environment, nothing much separates a 2000 attack monster from a 1900, both will control the field equally. The problem with this card is that there aren’t many offensive fire monsters around to help support it. Even if you find a way to use one if its effects, you’ll have either a 2000 attack monster (which isn’t that great), or a 1500 attack weakling that can attack twice. Not much advantage with this one. 4/10. Best Draw for the Situation: It’s hard to justify the use of a card that depends on other elements to gain weak effects. I’d understand if the attack boost was greater, or the wind effect was better, but they’re not, so this card isn’t a very good draw. It gets a score as if it were a basic 1500 monster; 2000 attack isn’t even very spectacular anyways, and the WIND effect is almost worthless. 2/10. Attributes/Effect: With a paltry attack score of 1500, a monster needs a very good effect to justify its inclusion into a deck. More than the actual numerical score of the attack, it’s more important to note the value of an attack score; for example, you don’t gain much field advantage by moving from 1900 attack points to 2000, but the drop from 1700 to 1500 is huge. It’s huge because it prevents Element Dragon from killing numerous threats, such as Breaker, Tribe, D.D Warrior Lady, and others. This makes Element Dragon a liability in most decks. 5/10. Dependability: You’re going to have to rely on fire monsters (which there aren’t much of) and wind monsters (Luster Dragon and Spear Dragon spring to mind). Of course, the WIND effect of Element Dragon is weak, and the FIRE effect turns him into a Berserk Gorilla (which is far superior to Element Dragon). 1/10. The Bottom Line: A great card in theory, a weak card in practice. 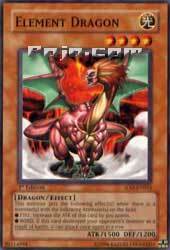 Cards it functions well with: Fire Dragons (Tyrant Dragon, Masked Dragon), Wind Dragons (Luster Dragon, Spear Dragon).